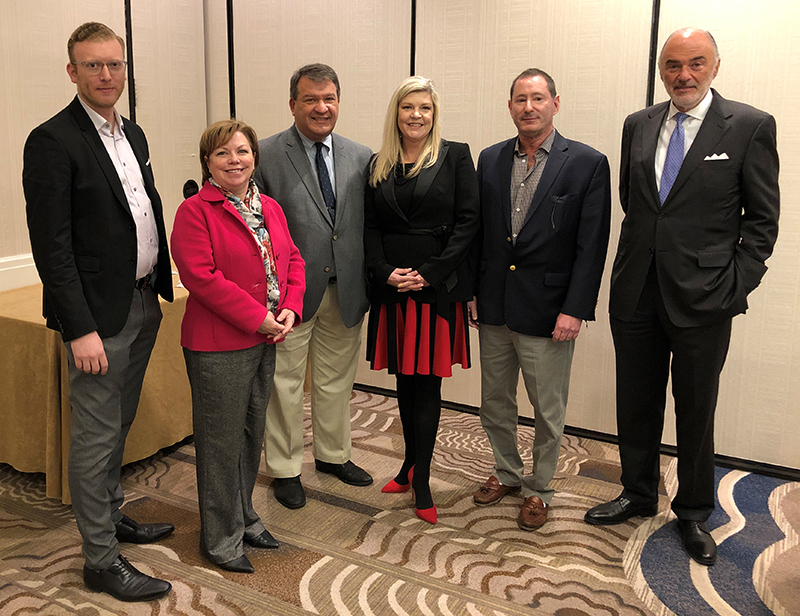 Shown (from left) are: Charles Epstein, VP of development, Lennar Multifamily; Bridget Gibbons, director, Westchester County Office of Economic Development; Westchester County executive George Latimer; BOMA Westchester president Susan Curtis; Guy Leibler, president, Simone Healthcare Development; and Robert Weisz, CEO, RPW Group. White Plains, NY More than 100 real estate professionals were on hand for the Annual State of the Market luncheon held recently by the Building Owners and Managers Association of Westchester (BOMA). The program, which was held January 10th at the Crowne Plaza, featured a panel of real estate executives including Charles Epstein, VP of development for Lennar Multifamily Communities; Guy Leibler, president of Simone Healthcare Development; and Peter Duncan, president and CEO of George Comfort & Sons. Robert Weisz, president and CEO of RPW Group, was the moderator. Among the topics discussed was the county’s booming market for health care facilities and rental apartments as well as the repurposing of obsolete office buildings for residential and retail uses. Westchester County executive George Latimer delivered the opening remarks. “We think more supply coming to White Plains is going to benefit awareness for White Plains,” said Epstein of Lennar which is building a 15-story tower with 434 apartments and ground-level retail on a site on Mamaroneck Ave., East Post Rd. and Mitchell Place. “What we see in Westchester County is there is a change going on … with the transformation of many former office buildings, which were not really cutting it, into other uses. We are trying to take advantage of that with some of the things we are doing,” said Duncan of George Comfort & Co. which has major office properties in Rye Brook and Purchase. “We’ve seen what has happened to those of us who have been in the office building market in the last 25 years, and certainly what’s happening in the retail industry with displacement and disruption. We think health care is, although changing, something we are all going to need for the rest of our lives,” said Leibler of Simone Healthcare Development, a leading developer of healthcare facilities in Westchester.